Ringworm; it sounds like a parasite, but it’s not. Ringworm is actually a fungus—a particularly nasty fungus because some types are zoonotic, meaning it can be passed from one species to another. It can also be contracted from contaminated objects or soil. Ringworm has no favorites and likes all types of cats, especially young cats, those that are sick and have a suppressed immune system. 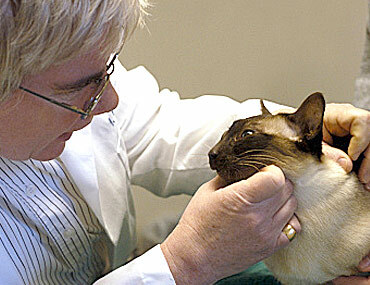 Some cats can become chronic carriers and shed the spores that cause ringworm without ever showing signs of infection. While most cats get over ringworm on their own, because it is a zoonotic disease, it is a good idea to keep an eye on your cat and contact your veterinarian if you suspect anything. Signs of ringworm can vary from cat to cat. Usually, ringworm starts with small, hairless lesions that look scaly. These may grow in size and tend to affect three areas of the body: the scalp, trunk, and nails. The most common place to find these lesions is the head, and in some cases, pustules (pimple-like lesions) form on the surface of the sore. Your cat may or may not be itchy. Some cats may be inapparent carriers and show no clinical signs. NOTE: The fungal culture and microscopic evaluation are usually done in tandem. Depending of the seriousness of your cat’s infection, your veterinarian may recommend a topical or oral antifungal treatment, though often both are used. Treatment is monitored with repeat fungal cultures or PCR tests. Multiple negative tests are needed to prove the infection has been eliminated. It is very important to make sure that your cat’s bedding and your home are thoroughly cleaned, as the spores that cause ringworm can survive for a long time in the environment. Following your veterinarian’s treatment recommendations is very important to ensure a successful outcome and to prevent recurrence of this problem. While ringworm isn’t common, it is very easily spread. Make sure that your cat isn’t exposed to other pets with ringworm, and contact your veterinarian immediately if you notice that your cat has a lesion.